Question: You said that during the evening of unity in Jerusalem you simply didn’t have words and the strength to speak because you didn’t feel a desire coming from the group. What is required of us here and now? How do we form such a desire and supply it to you so that you have the necessary words to share with us? Answer: This was indeed a very interesting and touching revelation for me. I usually never have trouble speaking because I live in what I say. And generally, just as any one talking about his family or interesting job, I speak about what is most important to me endlessly and in combination with anything else. But I suddenly discovered that I was unable to speak. And it happened even in advance of the event, for a few minutes before, I simply couldn’t understand what was happening to me. In Jerusalem, there was a serious meeting with a large audience. About a third of it, 1000 people out of 3000, were people who came just because they were invited. They weren’t our students, our friends. And I really wanted to speak well in my presentation. Because with my students, those who yearn to know and are involved, with them I am in contact. They are walking by my side: in ascents, descents, better, and worse—all together we experience the path. But in this case, with so many new people attending, I wanted to show them what we are doing, what we offer… and I didn’t have any strength to speak; I kept looking at the clock: one minute, two minutes passed. And I wanted to try to talk for at least half an hour; I didn’t know what to do with myself. And then it became clear to me: I wasn’t prepared well enough to talk with these people. It had to take place on a totally different level, at the level of unity with the group. Normally, I speak on my own behalf. I mean the students do give me their support and I do feel them, I sense our common, collective union, but I still speak for myself. Here it wasn’t the case. Here, I needed the readiness of the group so that during those minutes when I’m on stage, the friends would really feel like they are right next to me, fully. That is the desire I felt, that need. In other words, the support has to be not just in sympathy, but in mutual aid: “The friend went and we are supporting him.” No, I am there with him! I am with him now at the same time! I had never felt such a need for oneness. I absorb the energy of my students in order to supply them with what they want. I sense their desire, all kinds of nuances, fluctuations in their mood, and generally, various spiritual states. And even though it’s not the friends’ fault since I hadn’t prepared them for it, at that very moment all I wanted was for them to be “in me” consciously on their part. That is what I was lacking. Truly, we have climbed to a totally new degree where we must do everything together. There aren’t “me” and “you” anymore; together we work on creating a power of our unified desires, our aspirations toward revealing the world so that we feel real strength in this unity. If I say something, you are with me; and if you hear it, I am with you. This is the kind of mutual inclusion we need, and that’s what we learned two days ago in Jerusalem: Our connection is becoming mutual. And I am very pleased with it! This means that a lot of my students are rising closer and closer to my level and we are now able to communicate with each other at this degree. I hope that we will continue to interact this way with each other and further, representing one integral whole. There is no teacher, lecturer, or students who listen; rather there is one thing in common, the whole desire that wants to reveal the purpose of life! I think we can do it. Question: What does seeking balance at the level of “human” mean? How do we build the temple, to which you always come back? What does the term “temple” mean in Kabbalah? Answer: Seeking harmony is the most important law of nature. On the still, vegetative, and animate levels, nature does it automatically, instinctively, by its own forces. Based on all our research of space, the functioning of living organisms, of all of nature, the ecosphere of the Earth, we see how nature itself tends to equilibrium. Here it is warm, there it is cold; here is pressure, there is a vacuum, etc. A mutual combination of parameters takes place; that is, nature always tends to the average. Any forces tend to equilibrium. And so do we. What is the law of similarity? This means that if I am similar to you in something, we understand each other through our similarities. If my senses (for example, vision or hearing) are similar to what is happening in a certain range, then I sense it happening. That is, the law of similarity on our part is the basis of communication in our world. And on the side of nature, it is just the basic law of what it tends to: the law of similarity, the law of combination, averaging. This law applies to all levels except the level of “human.” At this level, nature, on the contrary, leaves us this opportunity. It seems to say: A human being must be engaged in his similarity to nature himself, averaging at the social and other levels. Why? Then he will rise to the level of “human,” instead of remaining an animal. And so we are in our world suffering all the time, although we are the smartest and the strongest. But considering what we do with each other and with the world, we are the most despicable. Based on the fact of what we do with the land on which we live, how we exhaust everything and each other, we are completely irrational. That is, here nature leaves us the freedom to choose—only to human beings! Thus, we have to learn this law. That is why Kabbalah teaches us how to realize the law of similarity in an individual and in human society. If we implement it correctly, it raises us and leads to the level of similarity to the upper force. To accomplish this, we, all seven billion people who live on the planet, must unite together, interconnected in such a way as to form one single desire. After all, all this exists in the program of nature; we will reach it anyway, either by the path of suffering or the path of awareness. In order to come to this by awareness and not just suffering (because this means terrible problems for centuries), the science of Kabbalah is revealed. But it must be implemented by always exiting ourselves to connect with others who are similar to us, who are also interested in this method of the revelation of the upper force. So, the law of similarity is the fundamental law of existence. In the News (from theintelhub.com): “While the ruling class continues to perpetuate the dehumanizing myth of “overpopulation”, a very different kind of situation is unfolding in the real world. “The number of births taking place worldwide have been in sharp decline over the past 20 years. If this trend continues then the world’s population will quickly peak and then begin a mysterious and dangerous decline. “Every single time throughout history that the human population has increased significantly as we have seen in the past few centuries, the commoners have been told that the growth of their community would result in chaos and mass scarcity of resources. “Of course, these predictions have never come to pass because the Earth’s human population actually has very little to do with the scarcity that exists on this planet. My Comment: The great Kabbalist of the early 20th century Baal HaSulam wrote that our planet can feed dozens of billions of people if only they would think about providing food to all the people on earth. Answer: We reform desires that have gone through the breaking. A person comes face to face with his evil inclination, and he perceives it as his own; that is, he takes the blame for it. He doesn’t identify himself with the point in the heart and cannot observe his desire from aside as the material given to him for correction. So far, he doesn’t cling to the Creator, who created this evil inclination, but identifies with the evil inclination itself. The Light has not clarified his desire yet and hasn’t severed it from the person to move him to the Creator’s side. So, one thinks that it is he who is bad and not the evil inclination. The Light has not sufficiently reformed him, hasn’t illuminated his desires, so a person doesn’t see the source of all evil and then of all good. In other words, he doesn’t consider himself subject to a singular power beyond which there is nothing else, and he doesn’t realize that he is always ruled by one source, which determines how bad the desires are and how to correct them. He doesn’t understand yet that he must ask to have selfish desires revealed and how to correct them. After all, everything is done by the Light that Reforms, which reveals the left line first. To the extent that one strives to reach total correction, bestowal, according to how much effort he exerts, the Light comes and reveals his evil inclination to him. He has to pray for the Creator to show him what he is lacking for perfection. The prayer is to reveal the desire to be human, to be perfect, faithful to the Creator, and to bestow. Revealing what I need for perfection is to see the deficiencies that I have to correct in order to achieve the good. But I don’t ask for my deficiencies to be revealed; a person is unable to do so. Due to our nature, we can only ask for good conditions. Our work is to come to this understanding that all desires, corrected and uncorrected, are in the Creator’s hands. And man is that small clever child who knows how to ask the Creator correctly. And then this whole monster will become revealed: the evil inclination, egoism, Pharaoh, which later on will change and get transformed into a good inclination, by way of restriction, the screen, and the Reflected Light. All of this descends from above, as it is written: “I created the evil inclination and the Torah to correct it since the Light in it reforms.” So where does a person come in, if at all, since the Creator said that everything comes from Him? What a person needs is awareness, a prayer for a good state. But he doesn’t want to ask for what is good; after all, his nature is the evil inclination. So he has to use the power of the group that will infuse him with these good values although he may not necessarily sense them. It looks as if they are playing a game; they are staging a good state and through this influence each other. Thus, a person achieves a greater and greater desire until the Light has finally reformed him. All of this is arranged so as not to rob a person of his freewill. He has to be aware that he is merely acting, while, in reality, has no desire for any of it, and that he opposes the true, perfect state. And the closer he moves to the right state, the greater freewill he is given, the more of the sinner in him is revealed, and greater doubts in needing this path unfold in him. He has to discern these things, matching himself against the other side, comparing good and evil. Hence, our entire work rests on our freedom of choice, and all we have to do is to offer ourselves to the influence of the group that we have built according to our understanding of the spiritual world. We should play so as to have the group affect everyone as if all of this is true. And then, everyone will come to the true prayer. Question: How can we bridge the gap between the perception of reality of those who study Kabbalah and the rest of humanity? Answer: According to the wisdom of Kabbalah, we create a special attitude towards us, towards reality, and towards the Creator, the upper force, which we discover according to the equivalence of form with it. According to our equivalence, we discover increasingly more of the 125 degrees, each of which is a whole new world, and in it a new me. On the other hand, most people’s attitude towards reality doesn’t change. A person remains on his level and perceives a fixed picture of the world to which he has grown accustomed. In addition, he is proud of it, he holds on to it, feeling that he is right, thinking that he is absolutely sane. We are constantly changing; we constantly have doubts, constantly ask questions. The next moment may turn out to be the opposite of the previous one. Our whole way is full of similar surprises that come from the inside. It isn’t by chance that it’s said, “Don’t believe in yourself until your dying day.” If you say something like this to someone on the outside, he will smile patronizingly, as if you are not from this world, as if you’re not human at all. When we approach him with our message, we need to understand his perspective, his perception doesn’t change and therefore, he is very sure of himself. This is how people feel in the current crisis—increasingly helpless, since they have no answers anymore. Once we could turn in a certain direction, we innovated things, we had revolutions, social revolutions, industrial revolutions, and cultural revolutions; in short it was clear to us what needed to be done. We always found a trend and we held on to it and were sure that we were right. But today it isn’t happening because the general bankruptcy is in every aspect of life. It’s a total, global, comprehensive bankruptcy. The main thing is that simple people understand clearly what is happening. The world is falling to pieces, so what does one have left? There are three things left: fascism, fanaticism, or an ascent, which the wisdom of Kabbalah offers. If we judge logically, there are no other options: education, culture, work, competition, technological advancement, space research, all this doesn’t work anymore, everything is falling to pieces leaving nothing in its place. This means that man himself has to change. But how? Fascism and fanaticism offer a rigid fundamental way: People should believe in something and be dedicated and loyal to it. We will insert a certain “fact” into his head which will become a new basis for his life and make a fanatic out of him, or in fact a “zombie.” This is what is happening in the Middle East; for example, here it seems like salvation to people. When the whole world is collapsing, a person is ready to raise the flag of his faith and even die for it. The right environmental conditions favor such a chain of events. It’s the same regarding fascism: “We are the best! We will follow our way and succeed no matter what!” A person learns short slogans that narrow his mind and help him feel internally consolidated when all the other rational principles of our world don’t work anymore. This is the reason for the crisis. On the whole, the wisdom of Kabbalah tells people: “We have to rise rationally to an irrational level.” It’s hard to understand this, but one way or the other, it’s clear that the struggle is against a big “narrow” ego, that is trying to pull and to bring people down, while we have to raise them up. Here things don’t depend on people’s strength or weakness. Fanaticism and fascism will be able to change people’s perception by promising them refuge from the troubles that hit them. Therefore, we have to activate our inner forces, the mutual connection between us, in order to draw the upper force. Then through the internal network it will spread all over the world so that people will feel there is another way and they will follow it. The negative forces aspire to pull a person into fanaticism, while we approach him differently from the inside, opening his eyes. This is the whole essence of the current struggle. This is exactly why the Nazis were so uncompromising regarding the Jews. We will succeed. There is no doubt about it. In the News (from the Ohio State University): “Bothered by Negative, Unwanted Thoughts? Just Throw Them Away. “If you want to get rid of unwanted, negative thoughts, try just ripping them up and tossing them in the trash. “In a new study, researchers found that when people wrote down their thoughts on a piece of paper and then threw the paper away, they mentally discarded the thoughts as well. On the other hand, people were more likely to use their thoughts when making judgments if they first wrote them down on a piece of paper and tucked the paper in a pocket to protect it. “The findings suggest that people can treat their thoughts as material, concrete objects, Petty said. That is evident in the language we use. “But how important is the physical action of throwing these thoughts away or keeping them in your pocket? To find out, the researchers conducted a third experiment using computers. In this case, 78 Spanish college students wrote their thoughts in a computer word-processing document. Some later used a mouse to drag the file into the computer recycle bin, while others moved the file to a storage disk. My Comment: The thought is not only material, it is also much stronger than any corporeal action, and in addition, it remains forever in the network of spiritual connections between us. The wisdom of Kabbalah consists of two parts: the concealed and the revealed. “Concealed” means forbidden to reveal. And what is the point in revealing? Indeed, everything can be written in books, but what a person can get from them depends on the state he is in. Thus one of the parts of the wisdom of Kabbalah is called “concealed,” because it is revealed only after certain conditions are fulfilled as a person goes through the cleansing of his ego. It is also called that way since the upper part of the world of Atzilut is inaccessible to us. Even if I learn about the smallest, initial level of the spiritual ascent and am still in the worlds of Assiya, Yetzira, Beria and only later enter the world of Atzilut, still, even the smallest level I am on, the first ten parts called “one level” (one level is made of ten Sefirot), already gives me an idea about all of creation, but in a minimal way, on a small scale. Then I rise and see, like on a map that I read on a larger scale, everything there is enlarged. But being at the bottom, I cannot bring the concealed part, GAR of Atzilut, its upper part, close to me in any way, which means to depict it. I can imagine different lower levels more or less, and then too I am always wrong, since every upper level is a new attribute regarding a lower level. Still, I can somehow imagine it, but not the levels that are concealed or that are called secret. All the levels below them are called revealed and we can reach them all, anticipating in advance what revelations they will bring us. The first Partzuf of the world of Atzilut is called Atik, from the Hebrew word “ne’etak” – “cut,” detached and cut off, from our attainment. The next Partzuf is called Zeir Anpin, and the upper part of its “head” is called Keter, or more accurately Kitra (in Aramaic), and this part is also concealed. Everything that is below this part is gradually revealed to us: Kruma of Avira, Mocha of Avira, Mocha Stima. The structure of all these parts is very interesting, since it is from them, from the revealed part of the head of Arich Anpin, that the Providence descends into our world, that our fate descends. Question: How should the lower use the connection with the upper for correction? Answer: The lower has to nullify himself in order to receive from the upper. It’s as if you are drowning in the river and someone throws you a rope so that you can hold on to it and reach the shore. For you “catching the rope” means reaching the initial level of equivalence of form. This initial equivalence of form is called annulment. Later the work becomes more difficult. 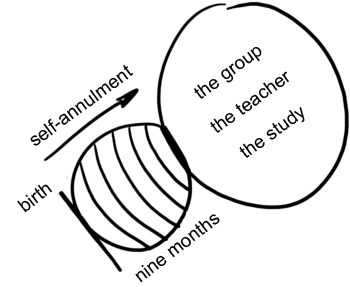 Although you have nullified yourself before the upper and have caught the “end of the rope” and you already have a link to it, you know that in order to start receiving in order to bestow, you have to create an inner deficiency in the link in addition to the self annulment and the simplest adhesion with the upper. Here a person has to act against his own opinion, thus inserting his deficiency into the upper and going through phases of Ibur (gestation). Otherwise, it will lead to nothing. “A man’s pride shall humiliate him,” and this is a very big problem. In our work, the group has the role of the upper. It should be a concept, an idea, the embodiment of perfection in my eyes, since the actual connection is already an upper attribute. Here an addition to self-annulment is required: By nullifying myself I adhere to the upper, and by continuing the work of annulment, I determine the connection with Him. In other words, by my initial self-annulment, I make a contact with the upper, with the group, with the teacher and the study. But in order to enter it, in order to receive from it, I have to nullify the “flesh” of my desire, layer after layer. This period is called “the nine months of pregnancy,” and eventually it will become a birth.